Pink Lemonade : Giveaway: This & That Axesoir + J'Adore New York!! Giveaway: This & That Axesoir + J'Adore New York!! 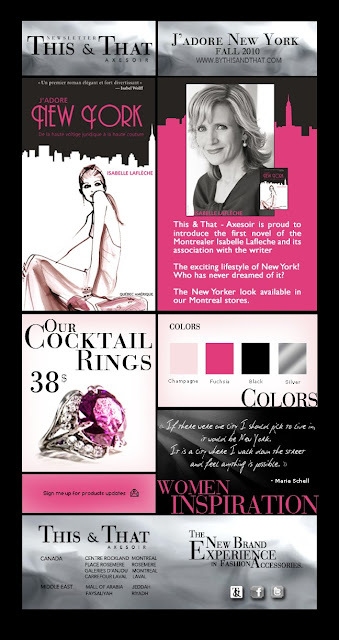 I am thrilled to announce that This & That Axesoir is partnering with my novel, J'Adore New York, for its most recent ad campaign! My books will be available in their gorgeous stores and there will also be some book signing events in a couple of weeks....In the meantime, I will be giving away one free copy of my novel as well as a stunning This & That Axesoir cocktail ring to two luck winners! Simply leave a comment about their most recent collection + become a follower!! I am a follower :) AND I love the vintage chic!! LOVE!!! Oooooh i love them both! enter me for them! I do follow (Queeninheels) and I like the Summer Princess collection. wow great pieces - love the vintage chic! Great giveaway, I'm a follower via reader. Congrats. Love ten VintageChic. Fun a Book a d Cocktail Ring :) happy weekend.